Pete Seeger assumed hosting duties for the show RAINBOW QUEST back in the 1960s, which saw a fabulous array of guests gracing television screens. 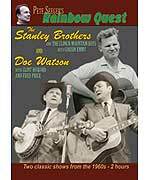 Among them were staples of the blues/bluegrass scenes Stanley Brothers and Doc Watson, who feature here. The Stanley Brothers are rarely represented in the visual medium, and this release represents their last filmed performance following the tragic demise of Carter Stanley shortly after filming.